What is financial literacy? The S&P’s Global Financial Literacy Survey defines it as the ability to understand essential financial concepts in making informed decisions about saving, investing and borrowing. The survey asked respondents a series of financial literacy questions. Here’s one example. Suppose you have some money. Is it safer to put your money into one business or investment, or to put your money into multiple businesses or investments? The answer is obvious to anyone familiar with risk diversification. 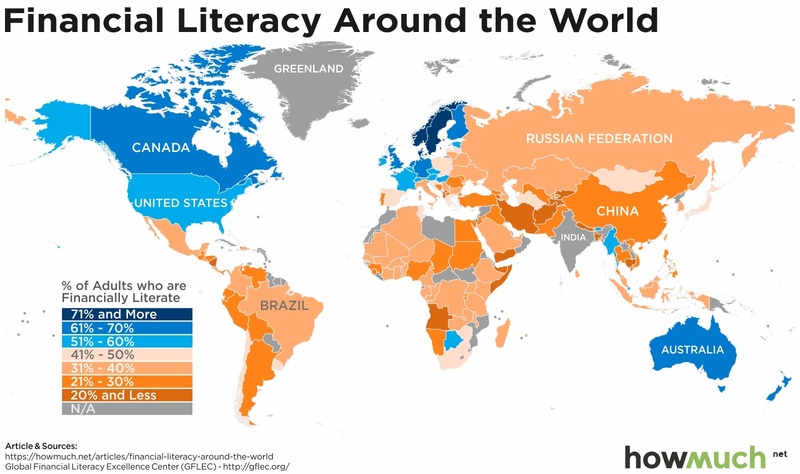 At the highest level, financial literacy around the world appears strongest in countries with developed and advanced economies, especially Western Europe and English-speaking countries. There are no countries in South America where more than 50% of people are financially literate, and only one country in all of Africa. Here’s a thought-provoking exercise. Compare this map to the one we recently created for extreme poverty around the world. There doesn’t seem to be a clear correlation between poverty and financial literacy. 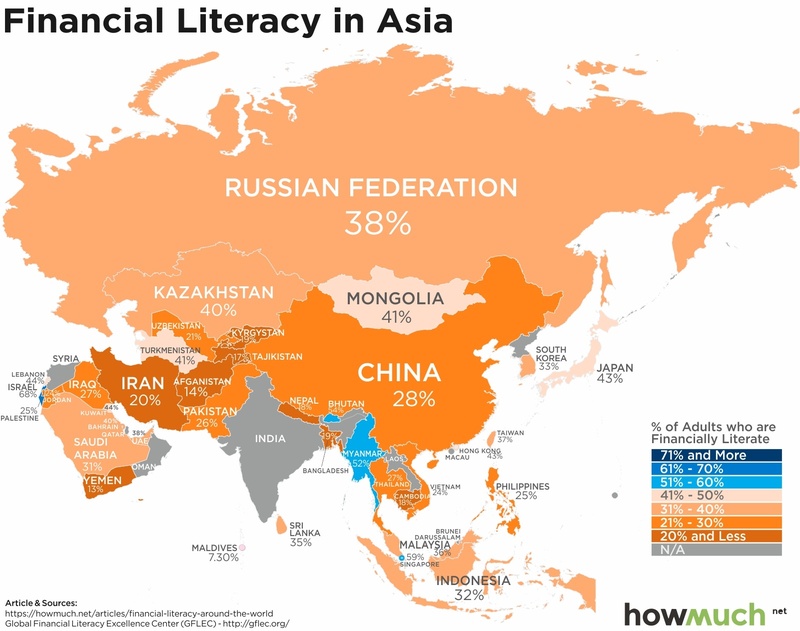 After all, there are many places with very few extremely poor people, like Russia and China, and yet these same places also have extremely low financial literacy rates. That means poor people aren’t necessarily financially illiterate, and neither are rich people. 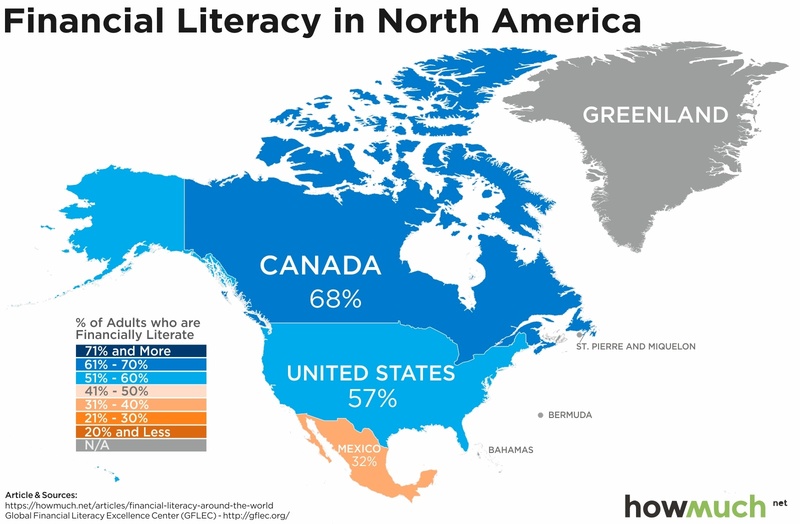 The obvious conclusion to draw from our map of North America is that financial literacy improves the further north one travels. Mexico’s 32% compares favorably to countries further south, but it stands in stark contrast to the US (57%) and Canada (68%). Researchers weren’t able to collect data from Greenland. 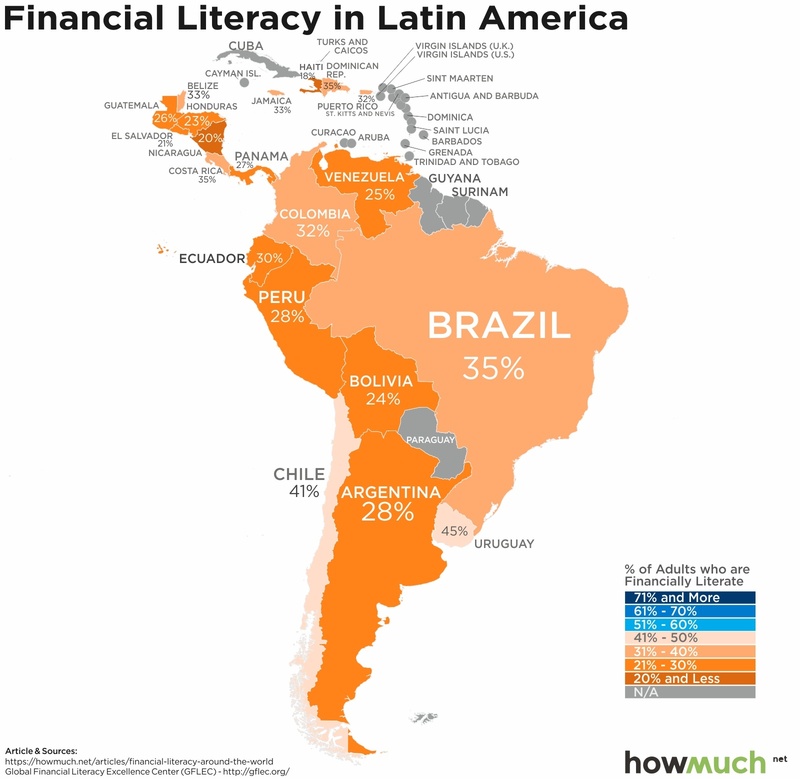 In a word, financial literacy rates in South America are depressing. Uruguay and Chile post the best rates at 45% and 41%, respectively, but most places fall between 21%-30%. There are no doubt lots of historical explanations for this disparity, but Nicaragua (20%) stands out as particularly troubling. It has the lowest score in all of Central and South America excluding the Caribbean, and it’s indicative of the desperate situation in that country. 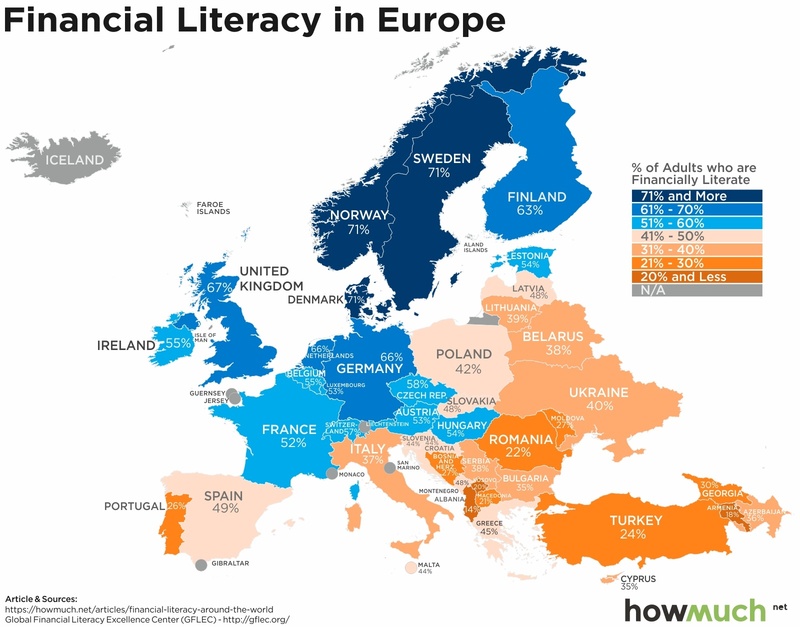 But there’s no other place in the world with such wide-ranging differences in financial literacy as Europe. The continent is anchored by a group of high scoring countries in Scandinavia, most notably Norway and Sweden (both scoring 71%). In fact, northwestern European countries appear to perform the best on the Financial Literacy Survey, and the further south one looks, the worse the situation. Portugal manages a paulty 26%, the worst in all of Western Europe. The Eastern Bloc, meanwhile, has some obvious and staggering problems, with no country east or south of Hungary scoring over 50%. Like on so many other measures of economic progress and development, Africa scores the worst of all the continents. Only one country, Botswana, breaks the 50% barrier, with more places falling in the 31%-40% range. 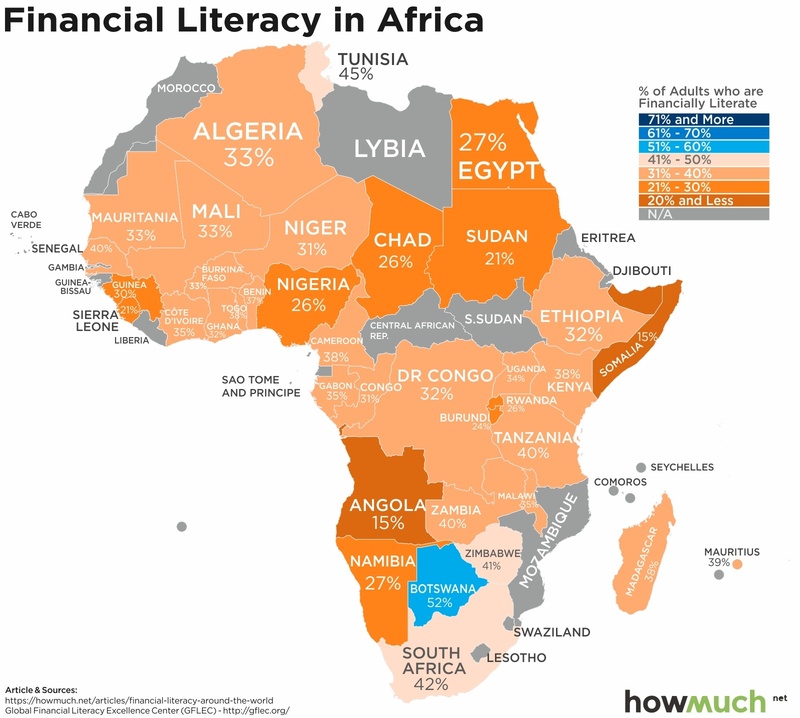 The worst country for financial literacy on the entire continent is Somalia, at 15%. The situation in Western Africa isn’t much better, where Sierra Leone is at 21%. The situations in Asia and the Middle East are comparable to Africa. Yemen (13%) and Afghanistan (14%) are at the rock bottom of the worldwide rankings, but they aren’t the only places in the teens. From Kyrgyzstan (19%) to Nepal (18%), Bangladesh (19%) and Cambodia (18%), there are several countries with horrible results. China scored a surprising 28% given it’s the second largest economy in the world. The most interesting standout countries in our opinion, however, are Myanmar and Bhutan, where a relatively impressive 50%+ of the population counts as financially literate. These rates are immediately next to some of the worst scores on the planet, proving that local factors can make a big difference. And finally, there’s really no surprise in Oceania. 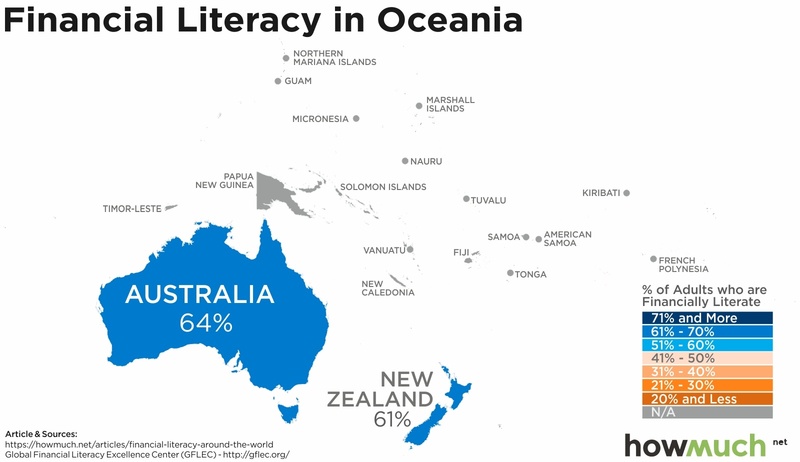 Australia (64%) beats out New Zealand (61%) for the top spot, but otherwise the Financial Literacy Survey wasn’t able to collect robust data from any other country in the region.